I will always love trees and the energy that they hold. For me this represents the strength and solidarity that many old trees have. 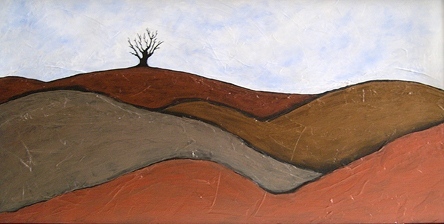 The hills remind me of sleeping bodies laying on their side with the lone tree watching over their slumber. I really like other artists use of dark under painting and this is my first try at the effect and I enjoy how the metallic paints look on the dark under painting.